With easy design is much easier and quicker than the traditional step in dog harnesses and only takes a few seconds to get on. Your dog will love these! The easy design is much easier and quicker than the traditional step in dog harnesses and only takes a few seconds to get on. Perfect! 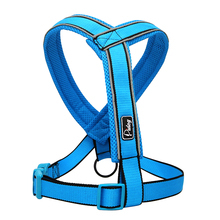 The quality is great and the harness itself looks beautiful. The store is also very helpful, thank you so much again! I definitely recommend this item.